SEOUL, Oct. 25 (Yonhap) — South Korea ascended two spots to take 53rd place in FIFA rankings released Thursday. According to the October rankings unveiled by FIFA, South Korea collected 1,401 points, up six points from September, and shared 53rd place with Jamaica. 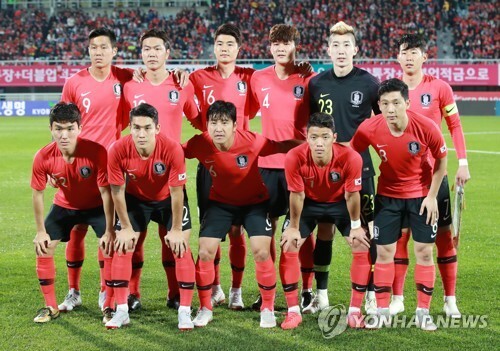 South Korea beat Uruguay 2-1 on Oct. 12 and drew with Panama 2-2 on Oct. 16 in friendly matches at home. Since Paulo Bento took the helm in August, the Taeguk Warriors on a four-game unbeaten streak. South Korea had the fourth-highest ranking among Asian Football Confederation (AFC) members. Iran remained the top Asian football nation at 30th, followed by Australia at 42nd and Japan at 50th. Belgium finished atop the rankings with 1,733 points, one point above the 2018 FIFA World Cup champions France. Brazil were No. 3 followed by Croatia and England. South Korea are scheduled to face Australia and Uzbekistan for friendly matches next month. Both matches will be held in Brisbane, Australia.